It's time to start saying goodbye to Splendour of the Seas. Royal Caribbean announced today that it has entered into an agreement to sell Splendour of the Seas to TUI Cruises in the second quarter of 2016. The ship will then be leased to Thomson Cruises, which will operate the vessel. Splendour of the Seas will complete all scheduled open deployment, and no sailings will be altered or disrupted due to the sale. "Splendour of the Seas has been a treasured member of the Royal Caribbean International family since she entered service," said Michael Bayley, president and chief executive officer of Royal Caribbean International. "She has offered countless guests memorable vacation experiences and we look forward to continuing to provide the same Gold Anchor Service our brand is known for right up to the last sailing." Her final sailing will commence on April 4, 2016, and all officers and crew will remain with the company and will be transferred to other vessels worldwide after the ship leaves the Royal Caribbean International fleet. Splendour of the Seas is not the only Royal Caribbean ship that will be leaving the fleet. 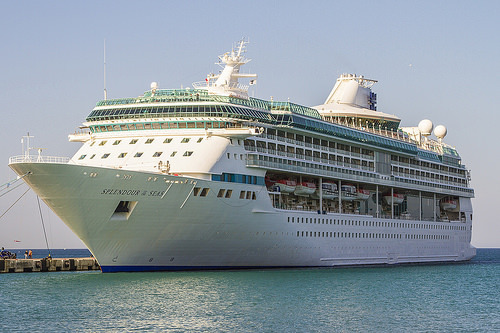 In November 2014, Royal Caribbean announced Majesty of the Seas will be transfered out of the fleet in 2016. Splendour and Majesty's exit from the fleet coincides with Royal Caribbean's cruise ship building spree that is underway, with four new ships set to come online in the next few years.